I always love hearing from my buddy Beth Zborowski at the Washington State Hospital Association. That organization and its members have been at the forefront of transparency for years, and they keep pushing the envelope. 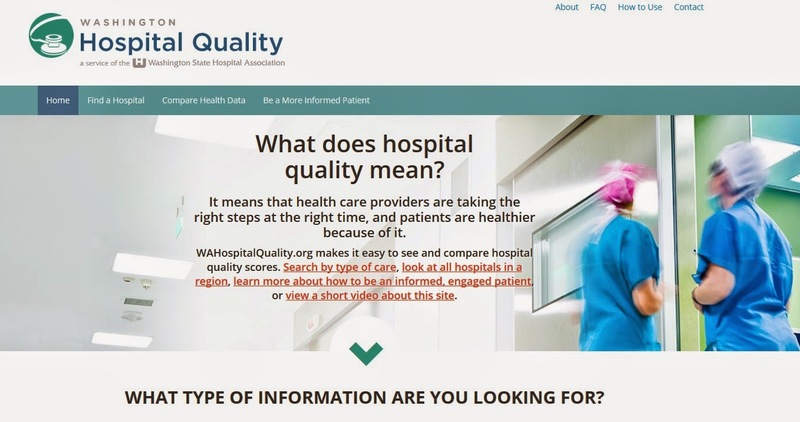 I wanted to share with you WSHA's new quality transparency website and would welcome your feedback: http://www.wahospitalquality.org. We've organized the site to provide relevant information to services patients (or their loved ones might be seeking.) For example, in the past, someone going in for surgery might only look at the specific measures related to their type of surgery, but may not think to look at other relevant or overall quality indicators, like CAUTI. So, please check it out and post comments here or send them directly to BethZ [at] wsha [dot] org. I am the CMO at one of Washington's largest hospitals, and I applaud WSHA for continuing to push us toward becoming a more transparent industry. As we look forward in our journey, we aim to report our data in more real-time fashion. All hospitals are mobilizing rapidly these days, and 2012 data may not reflect what is happening today. But again, this is a great start, and it is definitely moving us all in the right direction. Thanks to Carol Wagner and Scott Bond at WSHA for their leadership. Nancy, I'm curious, beyond combining cost and quality data to get to value information (which we would love to get to! ), do you have ideas for how we could make the site better for consumers? I would love your feedback. Thanks Dr. Roberts for the kind words!